Psst! More holidays are around the corner. Valentine’s Day is first. No one will force you to celebrate with droopy roses and boxed chocolates, though. Then Presidents’ Day is a few days later. That’s the important one—more for the long weekend than the former leaders of the United States. 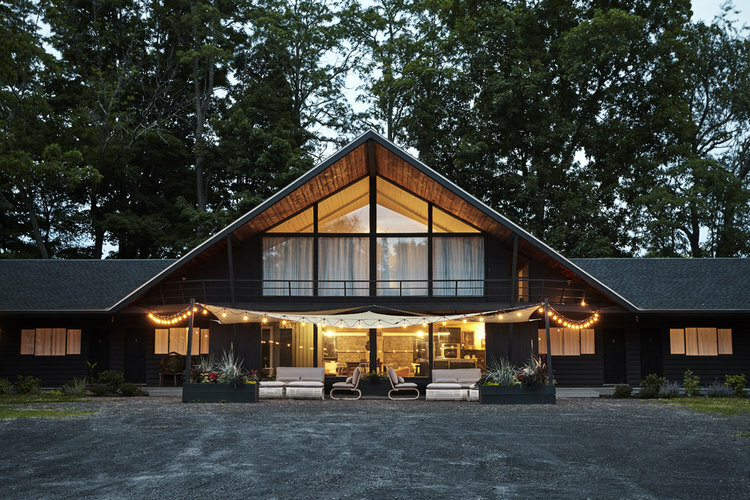 The Catskills are the perfect long-weekend getaway. Though southeastern New York’s section of the Appalachian Mountains is only about two-and-a-half hours from New York City, it feels much farther away. It’s known for its small towns, old farms, family-friendly ski resorts, and beautiful scenery. Hiking trails, farmers markets, breweries, and fly-fishing spots are here, as well. While the current trend is for old motor lodges to be revived as chic city escapes. One of these new spots is in Greenville, a little town along the northern edge of the Catskills. The A-frame building, with wings spreading out from both sides, was a 1960s motel in its first life. The property sits on four acres along the edge of another 95 forested acres. A few years ago, an interior designer and her artist husband bought the lifeless motel on the outskirts of town. They remodeled it into a 10-room lodge with a cozy lounge and a second-floor apartment for themselves. Then the Woodhouse Lodge opened in the fall of 2017. The Woodhouse Lodge is a relaxing escape. An oversized fireplace is the center of its lounge. It’s surrounded by gray walls, midcentury modern furniture, and a collection of vinyl records. There’s a new kitchen with a stainless-steel island, too. That’s where homemade breakfasts are served, snacks are sold, and wine deliveries from the Reed Street Bottle Shop arrive. Right in front of the lounge, there’s a canopied patio strung with white lights. It’s littered with wicker furniture and potted plants. A fire pit, hammocks, and a tree-lined lawn are beyond that. They’re covered with snow right now. As for the rooms, there are queens, kings, and doubles. Each one has wood floors and ceilings, handmade felt-and-leather headboards, Shaker peg rails, and vintage posters. LUFT mattresses are topped with Brooklinen sheets and merino wool blankets. The original fixtures in the bathrooms have been restored. Village Common natural bath products are now placed atop them. Plus wooden folding chairs sit right outside of the rooms. Presidents’ Day weekend can’t come soon enough.